On Cres, inspecting the northwestern part of it, closest to the mainland, we will spot Porozina as a possible sheltered spot. Porozina is a car ferry port, very busy indeed in summer, and so we do not recommend it to sailors. 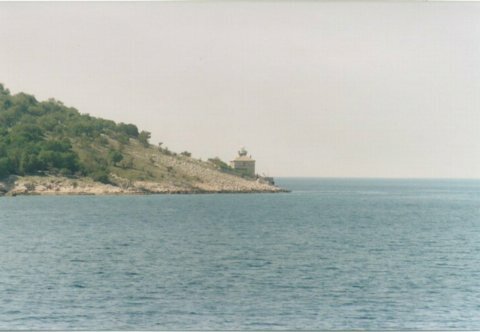 In summer, ferries link Cres and the mainland (Brestova - Porozina), sailing non-stop. In the southern part of the bay there is a fine beach for taking a dip. Ships of ten metres in length will anchor here without a problem - but we cannot recommend overnighting here. After the light on Prestenec Point, our course will take us by Pecenj Point. In the immediate vicinity of this there is a wreck on the seabed (a circumstance it very likely has something to do with), the frequent haunt of divers. So keep a sharp lookout for underwater swimmers, especially if you have a powerful speedboat. The name of the wreck is Lina. I have been unable to find any specific information on this lighthouse. If anyone knows about this lighthouse, please let me know.